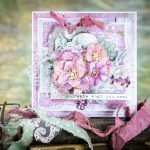 A card with a pocket can serve double duty! It can hold a give like a gift card and then can open to reveal a sentiment. 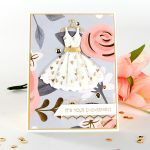 Today I am sharing a card that can be dressed up or down and is so quick and easy to make. Die cut a Library Pocket using the Library Pocket die (SR-076). Place the Big Woodgrain (SBS-047) stamp face up on your work surface. Tap brown ink onto the stamp. Place the short front section of the Library Pocket face down onto the inked stamp. Run your hand over the back of the pocket to transfer the design. Crease the folds on the Library Pocket. Ink the edges of the pocket along the cut edges and folds using an ink blending tool and a brown Distress Ink. Place adhesive (white tape shown here) on the two side pocket tabs. With the short side of the Library Pocket facing you, fold the two tabs toward the back. Bring the back flap of the Library Pocket up behind. Secure the back flap to the two side tabs. Die cut a Frayed Banner from cardstock. Fold the banner along the center crease. Brush the edges and fold with a brown Distress Ink using an ink blending tool. Place a Tim Holtz Typed Token on the right half of the tab near the center fold. Pierce a hole through the tab to match the hole in the token. Place a brad through the token and the hole in the banner. Flatten the prongs on the back of the brad to secure the token to the banner. Place adhesive on the back of the tab. Wrap the tab around the pocket, matching the center fold on the tab with the side fold of the pocket. Secure in place with the adhesive. Place adhesive on the back of the Library Pocket. Adhere the Library Pocket on the front of a blank card. Place a #8 manila tag in the Horsehair Embossing Folder (SEL-006). Ink the tag as desired after embossing. Did you notice the large size of the folder? With the extra large folders you can emboss a whole #8 tag! Lay the tag over the Library Pocket. Cut or tear the bottom edge of the tag so that it won’t be too long for the pocket. Brush the edges of the tag with a brown Distress Ink using an ink blending tool. Die cut two Shabby Posies (S4-628) from fabric. Color the flowers with spray ink. Place the tag inside the Library Pocket. Adhere the two flowers to the tag so that they are above the front edge of the Library Pocket. Tie a bow with a piece of ribbon. Adhere the bow to the tag under the two flowers over the tops of the âstemsâ. 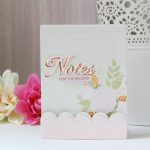 Embellish the center of the flowers with buttons, brad, or adhesive gems. Attach a gift card or other gift using an adhesive dot or temporary tape runner. Place the completed tag back in the Library Pocket. Isn’t that such a fun and easy card? The nice thing about it is that depending on your paper and ink choices, it can be vintage and shabby or bright and colorful. It is a great basic that you can use over and over again! PS. Here is a quick fun fact before I go…the woodgrain on the Big Woodgrain stamp was created from a photograph of the floor in the living room of my 1923 bungalow! I love for things to have a story to them and that is one of many from items in my collection.